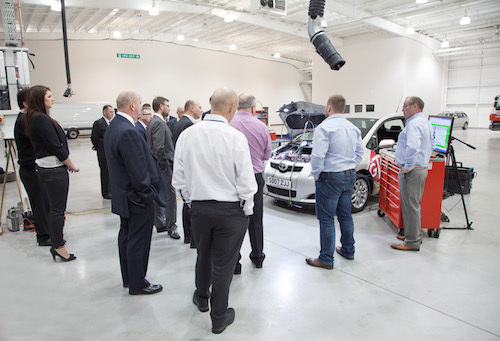 An innovative conference and hands-on technical and training weekend for UK independent garages is being backed by the campaign to promote the benefits of workshops fitting original equipment (OE) parts. The Original Equipment Suppliers Aftermarket Association (OESAA) is the driving force behind AutoInform Live, an event that has been organised in conjunction with the UK’s leading technical trainer Frank Massey to give visitors a ‘Hear it, See it and Touch it’ experience. The interactive two-day event is being held at the state-of-the-art 58,000 sq ft GTG Academy in Wolverhampton on Saturday, November 29 and Sunday, November 30, when independent workshops eager to improve their skills and knowledge base will be able to get to grips with the latest tools and products and attend top-class technical demonstrations and presentations. Members of OESAA, which was formed last year to promote the benefits of fitting OE quality components and to ensure that workshops and distributors can make an informed choice when purchasing spare parts, will be exhibiting at the event. The event is also open to non-members with ADS, Sykes-Pickavant, Pico Technology Ltd and Rozone Limited (Midtronics) already signed-up and the organisers expect further companies to join them over the coming weeks. Frank Massey has high hopes for the event which he believes will attract between 300-500 independent garages. He said: “All of our futures depend on providing the proper training to technicians and this event will bring together the people who make the parts and distribute original equipment components to the technicians who fit them. OESAA Chairman Nigel Morgan, Managing Director of Schaeffler Automotive Aftermarket (UK) Ltd, owners of the LuK clutch, INA tensioner & FAG wheel bearing OE brands, said: “OESAA are delighted to support this event as we think it is vital that independent garages get the right hands-on training they need. We are a partner in AutoInfom Live, but it will not be exclusive to OESAA members. Phillip Ellisdon, of fuel injection specialist ASNU Corporation Europe Ltd, has been a long-standing supporter of Frank Massey’s conferences. He said: “Frank always attracts the cream of the industry to his events. And the facilities here are fantastic and will be ideal for visitors to see what is available. AutoInform Live will comprise: advice on diagnostics; information sourcing; hands-on demonstrations; trade stands; taster GTG course; IMI Awards Certified Training; and customer handling with plenty of networking opportunities. There are also plans for a gala dinner to be held for delegates and their partners. The GTG Academy includes: a 58,000 sq ft state-of-the-art training centre and workshop where vehicles can be run live; a 250 seat conference suite; three IT rooms and eight classrooms; purpose built on-site driver training area; DSA Approved Testing Centre; five craft and technical classrooms; nine meeting rooms; and an on-site cafe and restaurant; plus it has more than 130 free parking spaces.